…with [none] of the folks from home. So, lads and lassies, it is my final post for 2012! 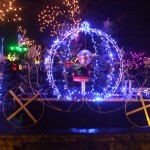 I had intended to write up two more after this, one featuring Corkian Christmas festivities and one featuring a now-unspecified adventure that I didn’t have because I am feeling rather weighed down by end of semester blahs and a decent essay load. The essays are done, and so are the blahs, but with my plane taking off on Sunday, I don’t have enough time for anything but packing! Ergo, here ensues one highly squashed-together post. As of December 3rd, I had the necessary paperwork to apply for my Italian visa for next semester, and the Italian ambassador was back in the office, so I scheduled a trip to the consulate in Dublin. Instead of taking a direct route, of course, I seem to have circumnavigated all of southern Ireland. 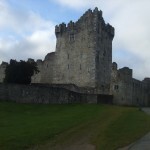 On Friday, December 7th, I loaded up my backpack with a few clothes and several tons of essay writing material (think laptop, books, notebooks, more books, a few more notebooks) and veritably staggered to the bus station, where I purchased a ticket to Killarney. 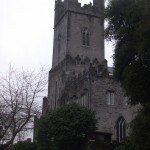 It wasn’t a terribly long trip, and, having learned from my trip to Waterford, I had only a few blocks to walk before I reached my bed and breakfast. It was already dark, so I dropped off my backpack and headed out for a walk around town. 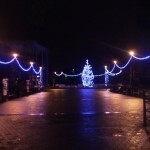 All the streets were lit up and Christmas cheer was in the air. Unfortunately, so was money. After nearly an hour of wandering, I was rather resigned to spending €20 on a meal; clearly, Killarney was geared toward tourists who were willing to spend that much. However, before I drained my bank account, I came across a Chinese restaurant serving good food for low prices. I ordered and proceeded to select a table, at which point the hostess protested, “No, no! The sit down menu is this one here!” Oh. Two courses, €25. I told her never mind; I would rather have the takeaway meal. Am I crazy for assuming that crab/sweet corn soup and duck in orange glaze would warrant a sit-down meal? It was the strangest takeaway meal I have ever had, and I ate it sitting in my hotel room, staring at my laptop screen and willing an essay to type itself. 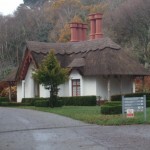 A thatched cottage in Killarney National Park. I don't recall the name of the estate. ravens croaked from the heights. As I walked around the bend, the horror movie setting was rather ruined by the cars in the parking lot and the children on the castle lawns; nonetheless, it remained an impressive monument by the lake shore. The Governor's Stone Rorschach Test: What do you think? Weird chair? Execution block? Wilderness impressionist art? Holler back and let me know! And in case you're wondering, no, I haven't researched it. I will. Eventually. coming eventually to a bit of rock called the Governor’s Stone (I think; there was no plaque). 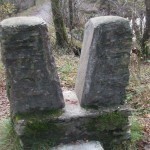 I couldn’t decided whether the stone was a cubist execution block or a highly uncomfortable chair. Either way, it was out in the middle of nowhere! I enjoyed taking in the isolated scenery before turning around and heading back into town. I stopped at St. Mary’s Church, this time wholly empty, before eating lunch, picking up my backpack, and returning to the bus station. 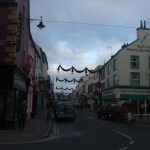 From there, I headed on to Tralee. The Rose of Tralee was not in town, and I missed the August rose celebration by several months. Nonetheless, I enjoyed walking around the gardens and the various notable churches of the town. I stopped for some afternoon tea and pulled out my laptop to book a room for the evening in Limerick, my next destination. I found nary a room available under €200, so I booked a room in Tralee instead. While I had intended Saturday as my “going-out” night, my essays hadn’t written themselves the evening before. I gritted my teeth, tied myself to the chair, and started typing. 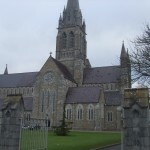 Not a great angle, but here's St. Mary's Cathedral in Limerick. Dear Limerick: Yeah, some of us are crazy enough to go travelling in December, and we would be willing to pay a few euro to see the INSIDES of these buildings. So, OPEN YOUR DOORS! This is King John's Castle. It's an imposing building--hard to fit in the camera frame. 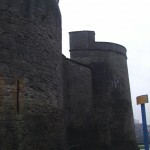 corner, hoping that King John’s Castle was open to the public. It was equally locked and barred, and its high walls and narrow windows made it look particularly unassailable. I stopped at a few more sightseeing attractions, but winter appears to be the “Go away!” season in Limerick. By this point, my jeans were wet and my hood, which I in my wisdom left down, had become a portable pond. I was feeling rather resentful toward the city as I trudged back to the train station. At the time, I was composing gloomy limericks about Limerick that I intended to post here, but I fear I’ve forgotten them. Anyway, I took advantage of the powerful hand dryers in the train stations to dry off my backpack, my coat, and my hair before boarding the train to Dublin. I won’t bore you with details of my time at the Dublin Italian Consulate, although I will say that, if you wish to apply for a visa of any sort, it is much easier to do from within the EU than from without. The process would have taken up to two months in the States, but it only took about two days in Ireland—or maybe a few more since my passport was mailed to me once it was stamped. Anyway, I stayed in the lovely Waterloo House, a bed and breakfast in a Georgian style building. Once I finished visa-ing on Monday, I met up with a friend for lunch at the Queen of Tarts (ahem, the kind the knave stole from Lewis Carroll’s Queen of Hearts, not the other kind). It’s a small tea shop with fabulous meals and even better desserts (think cinnamon cake and lots of chocolate). Then, as it was growing dark, I took a bus back to the train station and returned to Cork. My loneliness / is killing me...Britney Spears sing-alike night. Again, sorry it's blurry. My camera doesn't like the dark. Corkian light fest! It's the pumpkin coach. 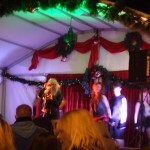 performances nearly every night. The first time I stopped by, a group was performing some jazzy Christmas arrangements, but the last time I visited, it was a Britney Spears sound-alike special. There are lights up all around the area, and all of the shop fronts have some lovely (and, let’s face it, some not-so-lovely) Christmas displays. 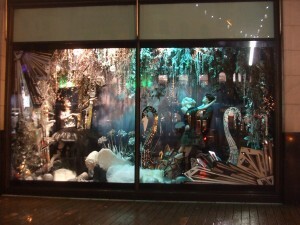 Some shop Christmas displays. This shop had four windows, so there were four of these. 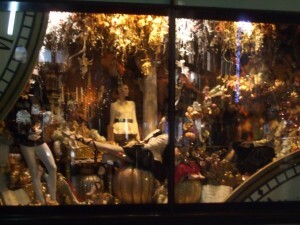 I'm still trying to decide if these window displays were in the lovely or not-so-lovely range. Gaudy or elegant? I'm not sure. Anyway, same shop, different window. P.S. Before I sign off entirely, can I get some good luck wishes? Some go n-eirie leat‘s? I am currently experiencing one of the ultimate joys of travelling: the rescheduled flight. My 9:00 a.m. flight to Newark doesn’t leave until 7:00 p.m. tonight, which means that I will be home nearly 24 hours after I should be. This is putting a kink in my Christmas plans. I might not mind so much if I had gotten more sleep recently…Well, I hope others are having better travel luck!